Dr. Shane Kenna held a Doctorate of Modern Irish History with an interest in late Victorian Ireland, awarded by Trinity College, Dublin. He advised the BBC and has worked in Irish History for several years as both a researcher and lecturer. Shane lectured at Trinity College, Dublin and Saor Ollscoil na hÉireann University. He also designed modules on Irish history for the American College, Arcadia University. He organised and managed several courses on Modern History and has spoken at over thirty international academic conferences. He was interviewed by Newstalk Radio, Near FM, BBC Radio 4 and has written for History Ireland, the BBC History Magazine, The O'Brien Press, Irish Academic Press and Kilmainham Tales. Shane was one of a new breed of young, active and enthusiastic historians who are changing how we look at history today. Very much 'out there' in promoting history, Shane encouraged and stimulated an interest in History - especially Irish history - among all. Believing that History is Life's lesson for the future, he was not satisfied to stand back and rest on his laurels, impressive as they are. Wynn's Hotel, Dublin and was a sell-out, major success. 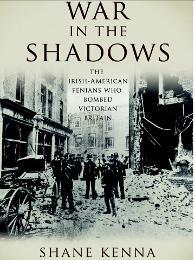 Shane's book “War in The Shadows: The Irish-American Fenians Who Bombed Victorian Britain” was released early December, 2013 by Merrion, an imprint of Irish Academic Press. The transformation from regular warfare to the strategy of a war of attrition within urban centers was an enormous development within the history of Irish Fenianism. Having its origins in the complex world of Irish-American politics, the Fenian dynamite campaign in Victorian Britain was undertaken between 1881 and 1885, and was largely a response to the failures of Fenianism in the previous decade. Involving many well-known Fenians - such as Jeremiah O'Donovan Rossa, Thomas James Clarke, and Denis Deasy (who died in British custody following arrest for his role in the bombings) - the campaign was as innovative as it was modern and represented an increasing predilection by the Fenians for clockwork mechanisms on explosive devices. As Shane described, this was the first time in history the bomber did not need to be close to his bomb before detonation, but could set it, deposit the explosive in an urban center, and have ample time to escape before detonation. This book examines the history of those dramatic events and also the story of how the British State responded to an adversary fighting a war in the shadows. Irish bombings in Victorian Britain would capture world headlines and the public imagination. The campaign left behind a significant legacy: for the first time in British history, the Irish question would not be confined to Ireland, but would affect British urban centers and sensibilities, reaching and touching not only the political elite, but the very people themselves. Shane continued to be very busy. In addition to all the projects already mentioned, in 2013 he took part in the Charleville Gathering weekend in memory of Archbishop Mannix. His paper was titled:“The Land for the People: The Land War in Cork” and presented Shane's insightful and original overview of the events of that time. Britain” for Merrion, he undertook to write a biography of Thomas McDonagh for the 16 Lives series from O’Brien Press. This on on top of a photo book he was working on for the National Library and to be later published by Mercier Press called "Conspirators". For Kilmainham Tales he had agreed to write a book on Charles Stewart Parnell and the Kilmainham Treaty, a topic on which he is an undoubted expert. Regrettably, this will not now happen. Apart from his busy writing career, Shane hosted a topical history radio programme, The History Show on Dublin South FM and currently is producing his own occasional internet radio show - History Now. 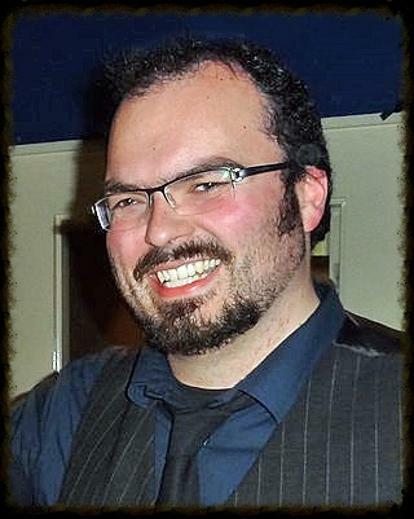 Shane's research interests included British and Irish politics in the 19th Century, and 19th Century Irish Nationalism. He was always available for lectures and was freely contactable via his personal website here. Shane wrote two Kilmainham Tales - "Resistance & Rebellion" - the story of the Fenians who carried the torch of Liberty and Equality trough the second half of the 19th Century, and "The Invincibles" - the story behind the Phoenix Park Assassinations of 1882. Both are available here. 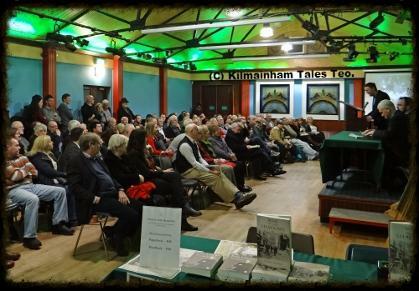 (Above) Part of the large crowd which turned up for the launch of Shane's "War in the Shadows" in The Teachers' Club, Dublin.